This sleek steel pistol safe provides secure storage for any household or office searching for a lightweight safe to store hand guns and other small valuables. The well-built PS915E safe comes with an electronic push button lock and a manual key override just in case the batteries should fail. Due to its weight and size it is a portable safe, making it easy to move, but it also comes with a mounting plate where it can be bolted securely to a wall or shelf. 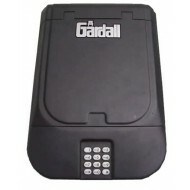 The Gardall GS2522 is a heavy duty anti-theft safe that is big enough to securely store several pistols and accessories. With its Group II combination lock it gives the assurance that no one will gain unlawful access due to the 1 million possible combinations. 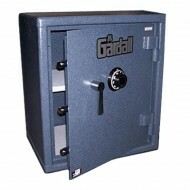 The safe can also be anchored down to the floor with the four anchoring holes available increasing the security of the contents inside making it perfect for protecting your valuables from theft and preventing any dangerous incidents with the handguns.